You’re seeking a new job, but not at any costs. This new job must absolutely comply with a list of criteria that you’ve established. In short, you’ll only apply for jobs that really suit you. But how can you easily identify job offers that meet your requirements? The job offers you consult provide a little information on the jobs available and on what the employer's expect. However, it can sometimes be difficult to figure out what you really want to know. How can you obtain the following information BEFORE applying? Will the challenge meet your expectations? Will the tasks to be performed motivate you? Will you get along with the current team? Will you have good chemistry with your future boss? Do the conditions offered really meet your requirements? Is the work environment suitable? ComparJobs is an innovative tool that analyzes job offers to detect those that best meet your expectations and requirements. Employers are increasingly experiencing problems in relation to employee motivation and retention, which is why many companies now pay special attention to the requirements of their candidates before hiring them. The concept is simple: by recruiting employees who will be satisfied by the available job, they increase their chances of hiring motivated employees who will stay on the job longer. ComparJobs therefore helps job seekers to establish a win-win relationship with their future employer. ComparJobs is easy and free to use. First, create your personal profile, which consists of filling out a short questionnaire on your expectations and requirements regarding the 9 professional satisfaction factors previously mentioned. This is also the step where you provide certain information to be submitted to potential employers when you apply for a job: your CV, contact information, and, if you wish, your LinkedIn profile. Signing up only takes a few minutes. As soon as you’ve signed up, our algorithm will search through all of the job offers posted on our site to measure your potential compatibility with the recruiting employers. The compatible job offers will be posted on your personal dashboard under the “These Jobs May Interest You” tab. We’ll also send you an email notification every time an offer compatible with your requirements is posted. Are the salary conditions suitable? Does the schedule correspond to your needs? Do the vacation and other benefits offered meet your requirements? Is the workplace easily accessible? Do you and the employer share professional values? Do you and the current team have any common interests? Will the professional challenge showcase your skills? Are you happy with the tasks to be performed? Will you enjoy the work environment offered? 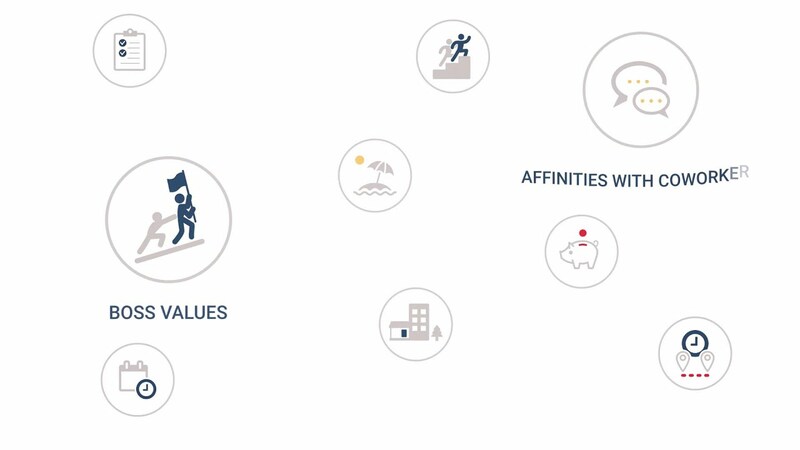 For each of these 9 factors, we’ll indicate whether the offer meets your requirements. We’ll also provide an overall compatibility rating for each of the job offers presented. You’ll then be able to easily decide if you should apply for a job, or let it pass. If you choose to apply for a posted job offer, you only need to click a single button. Your application will immediately be sent to the employer, who’ll also be able to view your compatibility with the job and have access to your profile information, such as your CV, LinkedIn profile, and contact information. Employers interested in your application can then contact you directly to invite you to an interview. Ready to find your dream job? Create your profile today!